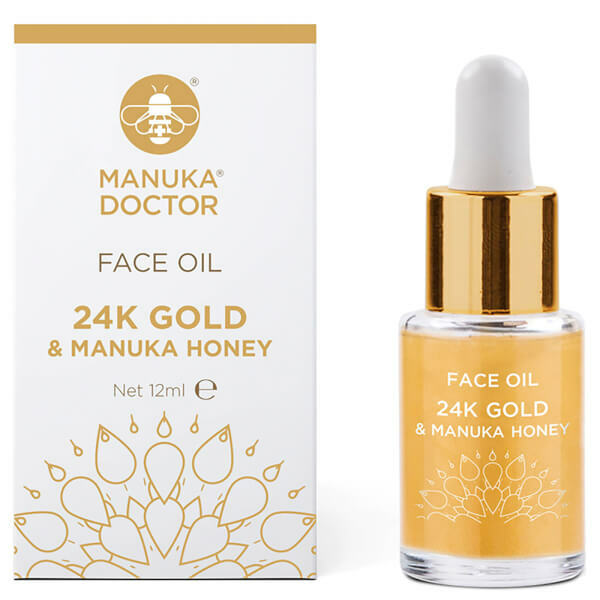 Reveal a naturally radiant complexion with the Manuka Doctor 24K Gold & Manuka Honey Face Oil; an exquisite beauty oil that hydrates and nourishes the visage. 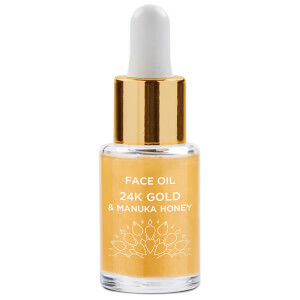 The facial oil is fortified with 24k Gold, Manuka Honey and a variety of luxurious Plant Oils, which work in synergy to visibly firm skin, whilst delivering a veil of essential hydration. The precious Plant Oils, which include Marula, Inchi and Kukui, also reduce the appearance of fine lines and wrinkles to restore a youthful appearance to the visage. Finished with a subtle gold shimmer, the silky formula instantly illuminates the complexion and highlights the facial contours. Expect ultra-smooth skin that is touchably soft and naturally radiant. After cleansing, dispense a few drops onto fingertips and gently massage in well to the face and neck until absorbed. Use morning and night under your day or night cream. Can also be mixed into your day or night cream and applied. Helianthus Annuus (Sunflower) Seed Oil, Prunus Amygdalus Dulcis (Sweet Almond) Oil, Simmondsia Chinensis (Jojoba) Seed Oil, Adansonia Digitata Seed Oil, Silica, Argania Spinosa Kernel Oil, Sclerocarya Birrea Seed Oil, Vaccinium Macrocarpon (Cranberry) Seed Oil, Mica, Tocopherol, Tocopheryl Acetate, Parfum (Fragrance), Mel (Honey) Extract, Limonene, Linalool, Citral, CI 77891 (Titanium Dioxide), CI 77491 (Iron Oxides), CI 77480.